The only people who may have had a better time than Torontonians during the Canada Day weekend were the many dozens of visitors from Philadelphia who arrived to see their hometown heroes: the Phillies and the Roots. The Roots raised the roof at the 2011 Toronto Jazz Fest, thrilling about 5,000 fans who congregated under the tent at Metro Square and spread out on the lawn on a cloudless Canada Day night on Friday. Black Thought (Tariq Trotter), ?uestlove (Ahmir Thompson) and crew scorched through their set that began a few hours after the Phillies rallied to beat the Blue Jays 7-6 at the ’Dome. Roy Halladay won on Saturday, of course, and the Phillies took the first two games of the series. Along with the Philly flavour, lots of other Americans arrived in town to take in the activities, which included the Pride events and the big show at Downsview Park, where L.A. band Weezer was one of four acts that opened things up for the Tragically Hip. Broken Social Scene, Hey Rosetta! and Buck 65 also played in front of 25,000. Canada Day festivities ended, as usual, with fireworks from Ontario Place, with hundreds of boats surrounding the barge as the lights shot to the sky. 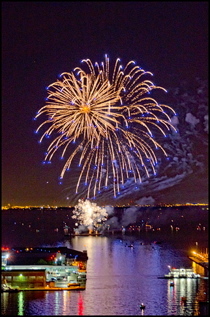 Rooftops and balconies on Queens Quay were filled with spectators who also got to glimpse the fireworks taking place in Port Credit and Hamilton. Unfortunately, the Toronto show was a bit of a dud, with a few apparent hiccups and a finale that only sent sputters of light into the air rather than the expected berserk explosions. 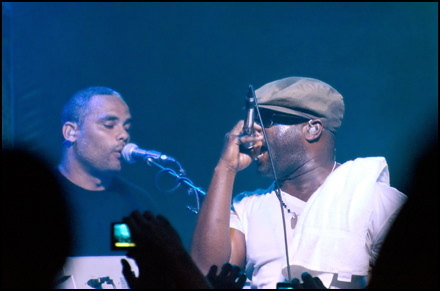 Kamal Gray (left) and Black Thought fired up the crowd at the Jazz Fest. With three perfect days of weather, the only real thing to complain about, though, is arrival of Monday. F. Knuckles of the Roots shows off his Philly allegiances. Youre indeed right on this writing..